When the U.S. declared war on Japan on December 8, 1941, the Roosevelt administration felt sure (thanks to confidential intelligence) that Nazi Germany would soon, in turn, declare war on the U.S. And sure enough Hitler did, on December 11. Even before that, however — on December 10 — the U.S. State Department approached Orson Welles. Hitler’s diplomats had been cozying up to South America for years, knowing full well that Germany would come to blows with the U.S. sooner or later, and Washington was alarmed at the number of south-of-the-border governments that had been cozying back. Shoring up relations with Latin America was a top priority. A request came from John Hay Whitney, head of the motion picture section of the State Dept.’s Office of Inter-American Affairs: Would Welles be willing to go down to South America, make a picture, and serve as a goodwill ambassador in the interests of hemispheric solidarity? There was a catch: The government wanted Welles to film Rio de Janeiro’s famous Carnival, which would begin in mid-February. Welles and his production team would have to be in place and ready to go by then. One episode of It’s All True (Bonito the Bull) was already shooting in Mexico, but plans for the rest were still pretty vague. In any case, none of them had anything to do with Carnival or Brazil, which meant rethinking and fast-tracking a picture that hadn’t had all that much thought so far. For starters, the Bonito shoot in Mexico was summarily closed down; if Welles decided to finish it, it would happen in California. A start date of January 6, 1942 was set for shooting Journey into Fear, with Norman Foster (reassigned from Bonito) directing, under Welles’s supervision and at his instrucion. And finally on the to-do list before leaving for Rio, The Magnificent Ambersons had to be finished. The picture had already ballooned well past its original $600,000 budget — $853,000 so far, with a full million just around the corner. George Schaefer wanted Ambersons to open Easter Week at Radio City Music Hall in Manhattan — that was traditionally a strong week for the box office, and offered the best chance to recoup RKO’s investment. Principal photography on Ambersons wrapped up on January 22, 1942; it had lasted a little over 13 weeks. Welles spent the rest of the month making pickup shots, working with Norman Foster on Journey into Fear and finishing his on-screen role in that picture, making his last broadcast of the Lady Esther radio show, and preparing to leave for South America. On February 2 he left for Rio by way of Washington D.C., where he was to be briefed by officials of the Office of Inter-American Affairs before continuing on to Brazil. During those same two weeks, Robert Wise assembled a rough cut of Ambersons and traveled with it to Florida to intercept Welles on his way south. 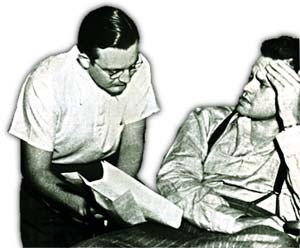 They spent February 5 at the Fleischer Animation Studios in Miami, recording Welles’s voice-over narration, screening the rough cut and conferring on Welles’s plans for the final cut — at least, as they stood at that point in time. It’s important to remember that what Welles and Wise worked on in Miami was just a rough cut — the barest assemblage of scenes with no music, special effects or fade/dissolve transitions. A rough cut is the movie equivalent of what in the theater is called a stumble-through, plowing through the show from beginning to end just to see what still needs work. The work that the rough cut needed is what the two men talked about that day in Miami; Wise would return to RKO and cut the picture to Welles’s specifications. 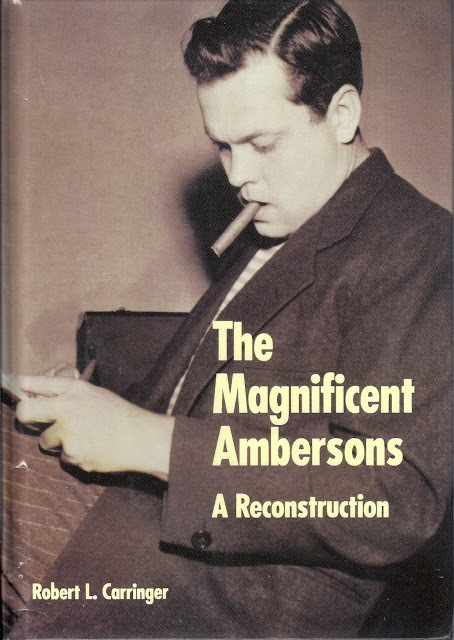 For a clear account of what happened over the four months after Welles flew to Brazil, I am indebted — we all are — to Robert L. Carringer’s The Magnificent Ambersons: A Reconstruction, published by the University of California Press in 1993. The book includes a prefatory essay, “Oedipus in Indianapolis”; an annotated copy of the cutting continuity of the first draft of the picture assembled by Robert Wise after his meeting with Welles in Miami; and a documentary history of the editing process compiled from extant studio records now housed at UCLA and Indiana University. 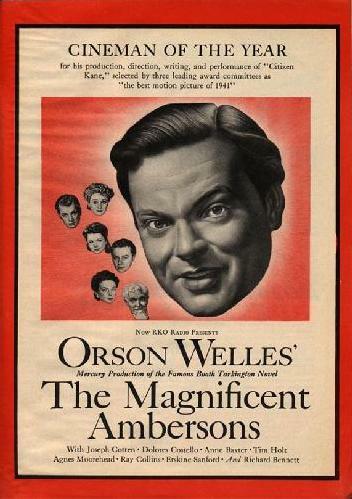 My own conclusions regarding The Magnificent Ambersons differ somewhat from Prof. Carringer’s, but the fact that I even have conclusions is thanks to his painstaking research sifting through the surviving records of RKO and Orson Welles’s personal papers. “Who knows what happened?” Welles rhetorically asked Barbara Leaming in the 1980s, referring to the editing of Ambersons while he was in Rio de Janeiro. In fact, the paper trail is thorough and, while cluttered, surprisingly clear — surely one of the most complete editing records for a single picture to survive from the entire Golden Age of Hollywood. And it often flies in the face of the accepted Ambersons legend. There’s one point on which Prof. Carringer isn’t really clear, however, and that has to do with Wise’s plans to join Welles in Rio to finalize the editing of Ambersons. On p. 27, Prof. Carringer says that Welles asked for Wise to come to Rio after their daily communications via telephone, telegraph and short-wave radio had proved frustrating and “impracticable”; then on p. 280 he implies that the plan all along was for Wise to bring the completed picture to Rio for a final check, along with alternate shots, dissolves and a spare music track for “the widest possible latitude in making changes.” Welles himself always held to the latter explanation, saying he had been “promised” a print and cutters in Rio. In one interview, he seems to imply that he would never have gone to Brazil in the first place if he had known Wise wouldn’t be joining him. This idea is not really credible; once Welles accepted the assignment, it was a matter of in for a penny, in for a pound. He couldn’t send somebody else to film Carnival the way Norman Foster had shot Bonito for him in Mexico. Not only the U.S. State Department but the government, press and people of Brazil were all expecting the one and only Orson Welles, in person. No underling would do. Besides, Foster had gone to Mexico with a clear story (by Roberty Flaherty), if not a detailed script, on paper. It’s All True was still nebulous; Welles, RKO and State were counting on on-the-scene inspiration to firm up the shape and dimensions of the movie they were going to make. In any case, Robert Wise never made it to Rio. The first cut was ready, and Wise’s travel was approved by George Schaefer. But at the last minute, Wise’s request to leave the country was denied due to wartime restrictions on civilian travel. RKO might have successfully appealed the decision, since Welles was in Rio at the government’s behest, but they didn’t try. It’s also possible that the studio had second thoughts about letting Wise go. The first cut wasn’t ready till March 10, and Schaefer was still hoping for and planning on an Easter Week opening, barely a month away. Having both the director and the editor 6,000 miles away in Brazil, and with a war going on, would just be asking for trouble, especially with the unpredictable Orson Welles. So instead, Wise shipped that first cut off to Welles on March 11 (it arrived March 15) and continued the long-distance consultations by wire and radio. The spine of Prof. Carringer’s reconstruction of Ambersons is the cutting continuity compiled by RKO from the print Robert Wise shipped to Orson Welles in Rio on March 11. The running time at that point was precisely 2 hours 11 minutes 45-and-one-third seconds. (This clarifies another part of the legend, which over the years has alleged various running times, some as high as three hours, for Welles’s version of the picture.) But while this was the most complete version of Ambersons, it was never intended to be the final one; it was understood by all concerned, including Welles, that the picture was running long at 132 minutes and needed further tuning, which could include cutting or retaking scenes (or shooting new ones), and would certainly incude sneak-previewing the picture, standard practice at the time. The second porch scene, another long take lasting a little over three minutes, came later in the picture and showed Fanny and Major Amberson discussing the Major’s financial problems and their mutual plans to invest in the ill-fated headlight company. This was in fact Richard Bennett’s longest scene in the picture, and the 71-year-old Bennett was unable to remember dialogue; Welles had been forced to feed him his lines one-by-one from off-camera, Welles’s voice to be edited out later. If that was the case here, it could well have played havoc with the timing of the scene and made it ultimately unusable. Whatever the reasons, neither porch scene (by unanimous agreement) was ever shown to an audience. 8. Isabel’s return, when she is too weak to walk a step. Wise went ahead and shipped the first 132-minute cut off to Welles in Rio as planned. Then he made the changes Welles had called for as he prepared Ambersons for its first preview. With the changes Welles had ordered, the picture now ran approximately 110 minutes. 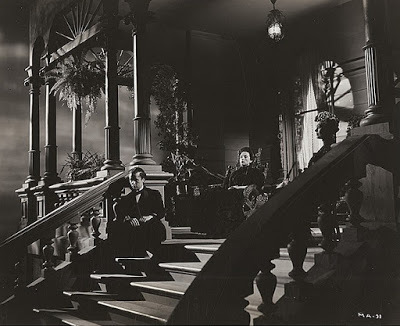 The Magnificent Ambersons had its first sneak preview on Tuesday, March 17, 1942 at the Fox Theatre in Pomona, Calif.
Wow! I think this series is longer than the original cut of the film! LOL! Another great edition to your MagAmbersons feature. Is Part 4 the last part? I hope so, Kim, but if it looks to spin out more than another 2K or so, I may have to go for Part 5. Thanks for hanging in there. To Be Continued is OK for serials but criminally hard for those of us enjoying these essays. Can't wait for the rest of them. Really first-rate material here. Jim, I can well imagine an HBO miniseries, a docudrama on the frustrating making of THE MAGNIFICENT AMBERSONS! I can see you accepting awards for your screenplay now, be they Oscars or Emmys! 🙂 Seriously, Jim, the details of your continuing saga of the film's travails have me on the edge of my seat. Great job, Jim, as always; looking forward to more MagAmbersons, as Kim put it, and seeing how it all ended up! Thanks, Dorian; I'll get started on that script right away! [wink] But first, of course, gotta finish this. Kim, looks like five parts'll do it.